Vertigo – also called benign paroxysmal positional vertigo (BPPV) – is described as a sensation of spinning and dizzy spells and can be quite dangerous the older we get. It can increase the risks of falls which lead to more serious injuries. In an epidemiological study, researchers estimated that 35 percent of adults over the age of 40 in the United States have experienced some form of vertigo. 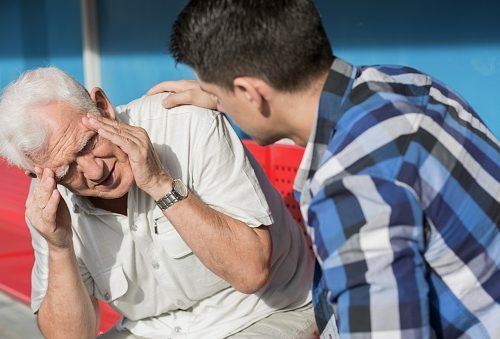 Furthermore, the National Institute of Deafness and Other Communication Disorders (NIDCD) reports 2.4 million Americans report chronic dizziness and 80 percent of senior Americans (those over 65) have experienced dizziness and vertigo. With numbers so high, understanding causes of vertigo, and recognizing the signs and symptoms of vertigo, is important. Vertigo can come in different stages – mild, moderate and severe vertigo. Mild vertigo is when the dizziness is brief but there is no link between the vertigo and nausea. Moderate vertigo is the presence of dizziness but it goes away when you sit or lie down. In this stage, vertigo and nausea are present. Lastly, severe vertigo is when no matter what position you are in – moving or being still – the dizziness does not stop. Vertigo and nausea at this stage are tightly linked and vomiting can occur with every sip of a beverage. According to the Mayo Clinic, doctors have a difficult time pinpointing the causes of vertigo. Possible causes of vertigo, though, are mild head trauma, damage to the inner ear, and even chronic migraines. Possible causes for vertigo also extend to calcium particles which clump in the canals of the ear. This buildup can appear worse when we lie down because the clump moves creating a greater blockage. Your ear sends signals to your brain in regard to movement of the head – this is what keeps us balanced. A stroke or tumor can also disrupt these signals making it part of the causes of vertigo. ringing in the ear or hearing loss. This signs and symptoms of vertigo can occur together or separately. They can also last for a brief period of time, stop then return, or stick around. Often the onset of these signs and symptoms of vertigo occurs mostly when there is a change in position. For example, when you go from lying down to standing up. These signs and symptoms of vertigo are linked to severe vertigo and should be addressed immediately. As dizziness is the No. 1 sign and symptom of vertigo, let’s explore this a bit further. First, we must understand dizziness. Dizziness is the feeling of fainting, spinning or tilting. It can have a variety of causes, such as low blood pressure or low blood sugar, but a main one is vertigo. Reasons for vertigo-dizziness are because inflammation forms in the ear. This can be sudden and bring upon intense feelings of dizziness. In situations like BPPV, reasons for vertigo-dizziness are brought on because of sudden changes in movement, like getting up or turning your head. Another possible reason for vertigo-dizziness is the onset of Meniere’s disease. This disease causes fluid in the ear, migraines and even a benign growth on the nerve which connects your ear to the brain. It’s important to pinpoint the reasons for vertigo-dizziness as it can help with treatment. Now that we understand what is vertigo, along with causes of vertigo and signs and symptoms of vertigo, let’s go over possible treatments as well. The Mayo Clinic suggests two main forms of treatment for vertigo: Canalith repositioning and surgery. Canalith repositioning occurs at a doctor’s office where the doctor will move your head around in order to move the particles and fluid within the ear. This procedure is usually done a few times for it to be most effective and lying down after treatment is not recommended as it may move the particles back in their original place. On rare occasions and only after canalith repositioning has failed, surgery may be recommended. A bone plug is inserted within the ear which prevents the ear to respond to particle movements during head movements. Although vertigo can take a toll on your life, managing the symptoms and understanding the causes can better help you understand what vertigo is and how to treat it. Feeling dizzy all the time is not fun, so make sure you are being careful. When you have moments you feel you could fall, prepare yourself. Vertigo does not have to be just a normal part of aging, so if you notice any differences to your head, and signs and symptoms of vertigo start to develop, seek medical attention right away. As you now know, vertigo can come in many forms, ranging from mild to severe vertigo. Some vertigo symptoms may only last briefly, where others can last for much longer. Joining support groups, or seeking support from friends and family, can help you manage your vertigo and ensure you continue to enjoy all the things you like to do.